Tour2.0 is a platform that takes you on a journey of discovery through authentic community tours and tour packages that are based on real African stories told by community members within the context of their community. Tour2.0 enables you to read about and experience any of our tours in Johannesburg and Pretoria in real life, allowing you to discover the uniqueness of every community on our platform. Location of the 18 transfrontier peace parks in Southern Africa. Each community has a unique story to tell. We enable the visitor to experience this uniqueness. This gets people to understand other cultures by immersing them in the community. And they come to appreciate the history of the different cultures. We don’t do “pity tourism” geared toward driving donations. We share and expose tourists to the good stories within the community. We don’t turn a blind eye to the problems that communities face, but our emphasis is on the good. For our purposes locals have to participate. The first point is the guide. The guide has to be a local person who tells the communities story. When the guide is local, the information is more insightful. Once the community realizes that the guides are local, they are more welcoming to visitors because they know they are being represented by a fellow community member. This makes them more willing to participate, for example to welcome the tourist into their home. Another point is that the tourist eats local food prepared by local cooks. And they have the opportunity to buy arts and crafts from local artists so that their money remains in the local community. Our aim is that after experiencing the tour the visitor leaves with an appreciation of that community, its history, culture, present state and where it is going. 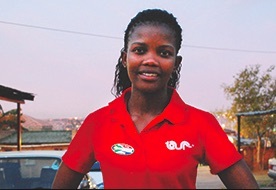 For example within the township of Alexandra, a local guide is a young lady named Asanda Daza. She is a 22 year old from Alexandra who is passionate about her community. Her tour is named “Lights, gangs and all that jazz.” She takes tourists through Alexandra’s cultural district, with visits to King’s Cinema, a cinema where jazz greats like Hugh Masakela frequently played before being exiled during apartheid, and where the legendary Nelson Mandela came to watch movies when he lived in Alexandra. She also has you visit Msomi gang headquarters to learn about the gang rivalry between the Msomi and Spoiler gangs from the 1950’s to the 1970’s. Her tour ends at a local jazz club where tourist are entertained by local jazz artists and traditional singers. Another example is Lebo’s Backpackers Tours in Soweto which also involves the community in all aspects of the tourist’s experience and which tells the rich story of Soweto. How can tourism promote a culture of peace? Can tourism be seen as an instrument to achieve complicity between people’s minds? “There is nothing better that connects two people’s mind than a good conversation” The above quote could be used to describe the effect which tourism has on people. Like a great conversation, tourism could be said to play a vital role amongst people all over the world. It fosters communication in all its senses, intercultural dialogue and mutual understanding. In today’s world it is evident that there is a shortage of moral or ethical values amongst people across the different nations in this world, resulting in a globalised world lacking these morals and ethical values. Ignorance, the failure to consider the needs of others, and selfishness are a few of the ways which hinder us from embracing diversity and a common human perspective, which would result informal empathy, internal moral compassion, tolerance of differences, historical consciousness and interpretation. The above mentioned features are intrinsic, inherent and can be found in the practice of tourism. Tourism has been emphasized as one of the most effective instruments which continue to tackle to tackle social and economical poverty, as well as encourage the culture of peace practice amongst people. In looking at the UN architecture, one is able to see the growing implications which the tourism sector has on the world and world policies. The touristic phenomenon has achieved a world record of 5% of world’s GDP contribution and is responsible for 235 millions jobs, according to the UNWTO’s data. Often the tourism sector counts more than 20% of the countries’ GDP. On the negative side of this, it is evident that tourism focuses on economical matters, depriving any focus on the global implications of the constant interaction tourism encourages. In the literal sense, tourism is nothing more or less than people meeting with the willingness to understand each other’s differences and point of view and simultaneously creating the opportunity for dialogue, mutual understanding and peace to take place. Apart from tourism, various factors could be seen to play a role in encouraging integration and diversity amongst societies across the world. For example, the cultural segment has played an essential source of people’s integration and inclusiveness in developing countries. Education has also played a significant role in encouraging integration, and incorporation amongst people all over the world. Education has been reconsidered and proposed to being the catalyst for exchange between countries, cultures and sectors, and most importantly for enhancing the lives of people by granting them the opportunity to leave their poverty stricken lives and societies in exchange a for better future which includes job and exchange opportunities. In the tourism world, differences play the most essential role, differences among people represents the added-value. Being different is always a positive factor that usually motivates and encourages people to get to move and engage with each other and embrace the differences with the use of spiritual, religious and cultural meanings. This notion of tourism needs to be addressed in multilateral governance discussions, where all the main actors, the international community, the ministerial and experts, private sector, local institutions and civil society engages are all present, and are all willing to work together in combined efforts and initiatives (from poverty alleviation to the promotion of awareness of sustainable development addressing special needs like regional development, urban planning and protection of natural and cultural landscapes). This combined approach of working at the local level within communities and at the national and international level, in order to reach and engage the poor, has been considered as potentially being the “one possible and effective answer” and effective approach towards the world’s poorest areas where it can make a difference.